At Galaxy Zoo we’re really proud of our publication record – 48 papers and counting, just from the team using your classifications. In academic research one of the most important numbers a published paper has is the number which counts how many citations that paper has – simply a count of the number of other academic publications mention your work. I’m personally especially proud of paper number 8 on that list, because it is one of the first papers I led making use of Galaxy Zoo classifications (and one of my most cited first author papers in fact). In that paper we explored the properties of the unusually passive (ie. not star forming) red spirals that had been noted in both Bamford et al. 2009 and Skibba et al. 2009. For astronomers this is one of the more well known discoveries from Galaxy Zoo, and these passive red spirals continue to be studied for what they can reveal about the modes of evolution of galaxies in our Universe, and that many spirals must stop forming stars before they lose their spiral structure. A red elliptical and blue spiral (top), with a blue elliptical and red spiral (lower). (By the way for academics who might be interested the h-index of Galaxy Zoo is 24). After two rounds of comments and questions from the journal referee, the first paper discussing the detailed results of the Hubble observations of the giant ionized clouds we’ve come to call Voorwerpjes has been accepted for publication in the Astronomical Journal. (In the meantime, and freely accessible, the final accepted version is available at http://arxiv.org/abs/1408.5159 ) We pretty much always complain about the refereeing process, but this time the referee did prod us into putting a couple of broad statements on much more quantitively supported bases. Trying to be complete on the properties of the host galaxies of these nuclei and on the origin of the ionized gas, the paper runs to about 35 pages, so I’ll just hit some main points here. Incorporating spectroscopic information on both internal Doppler shifts and chemical makeup of the gas we can start to distinguish smaller areas affected by outflow from the active nuclei and the larger surrounding regions where the gas is in orderly orbits around the galaxies (as in tidal tails). We have especially powerful synergy by adding complete velocity maps made by Alexei Moiseev using the 6-meter Russian telescope (BTA). In undisturbed tidal tails, the abundances of heavy elements are typically half or less of what we see in the Sun, while in material transported outward from the nuclei, these fractions may be above what the solar reference level. There is a broad match between disturbed motions indicating outward flows and heavy-element fractions. (By “transported” above, I meant “blasted outwards at hundreds of kilometers per second”). 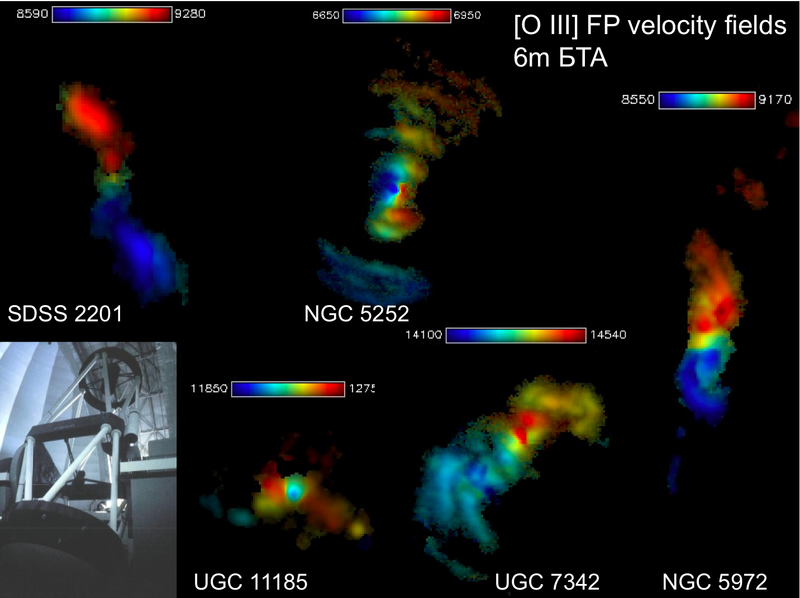 Seeing only a minor role for these outflows puts our sample in contrast to the extended gas around some quasars with strong radio sources, which is dominated by gas blasted out at thousands of kilometers per second. 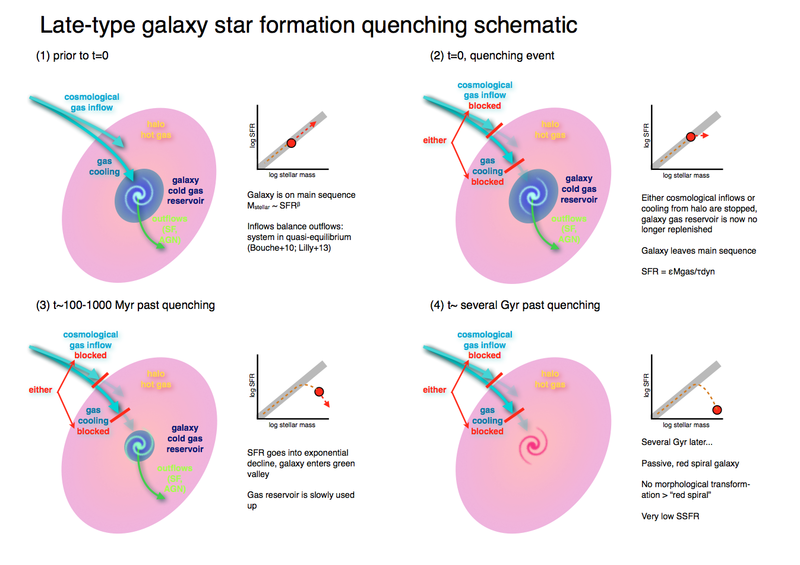 We’re seeing either a different process or a different stage in its development (one which we pretty much didn’t know about before following up this set of Galaxy Zoo finds.) 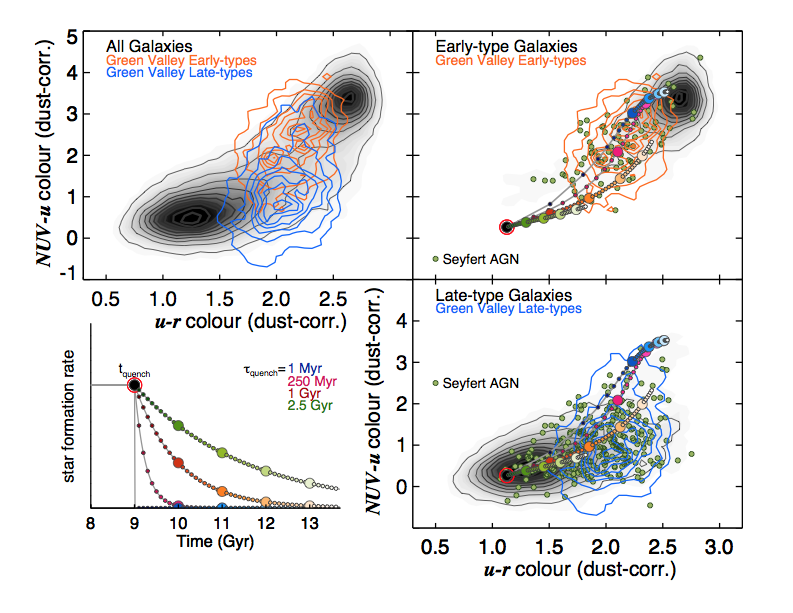 We looked for evidence of recent star formation in these galaxies, using both the emission-line data to look for H-alpha emission from such regions and seeking bright star clusters. Unlike Hanny’s Voorwerp, we see only the most marginal evidence that these galaxies in general trigger starbirth with their outflows. Sometimes the Universe plays tricks. One detail we learned from our new spectra and the mid-infared data from NASA’s WISE survey satellite is that giant Voorwerpje UGC 7342 has been photobombed. A galaxy that originally looked as if it night be an interacting companion is in fact a background starburst galaxy, whose infrared emission was blended with that from the AGN in longer-wavelength IR data. So that means the “real” second galaxy has already merged, and the AGN luminosity has dropped more than we first thought. (The background galaxy has in the meantime also been observed by SDSS, and can be found in DR12). Now we’re on to polishing the next paper analyzing this rich data set, moving on to what some colleagues find more interesting – what the gas properties are telling us about the last 100,000 years of history of these nuclei, and how their radiation correlates (or indeed anti-correlates) with material being blasted outward into the galaxy from the nucleus. Once again, stay tuned! 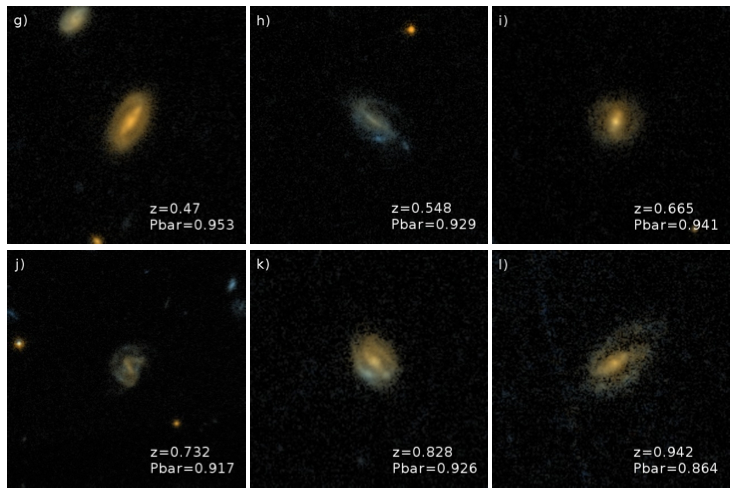 I’ve used some statistical tools to analyze the spatial distribution of Galaxy Zoo galaxies and to see whether we find galaxies with particular classifications in more dense environments or less dense ones. By “environment” I’m referring to the kinds of regions that these galaxies tend to be found: for example, galaxies in dense environments are usually strongly clustered in groups and clusters of many galaxies. In particular, I’ve used what we call “marked correlation functions,” which I’ve found are very sensitive statistics for identifying and quantifying trends between objects and their environments. This is also important from the perspective of models, since we think that massive clumps of dark matter are in the same regions as massive galaxy groups. We’ve mainly used them in two papers, where we analyzed the environmental dependence of morphology and color and where we analyzed the environmental dependence of barred galaxies. These papers have been described a bit in this post andthis post. We’ve also had other Galaxy Zoo papers about similar subjects, especially this paper by Steven Bamford and this one by Kevin Casteels. What I loved about these projects is that we obtained impressive results that nobody else had seen before, and it’s all thanks to the many many classifications that the citizen scientists have contributed. These statistics are useful only when one has large catalogs, and that’s exactly what we had in Galaxy Zoo 1 and 2. We have catalogs with visual classifications and type likelihoods that are ten times as large as ones other astronomers have used. What are these “marked correlation functions”, you ask? Traditional correlation functions tell us about how objects are clustered relative to random clustering, and we usually write this as 1+ ξ. But we have lots of information about these galaxies, more than just their spatial positions. So we can weight the galaxies by a particular property, such as the elliptical galaxy likelihood, and then measure the clustering signal. We usually write this as 1+W. 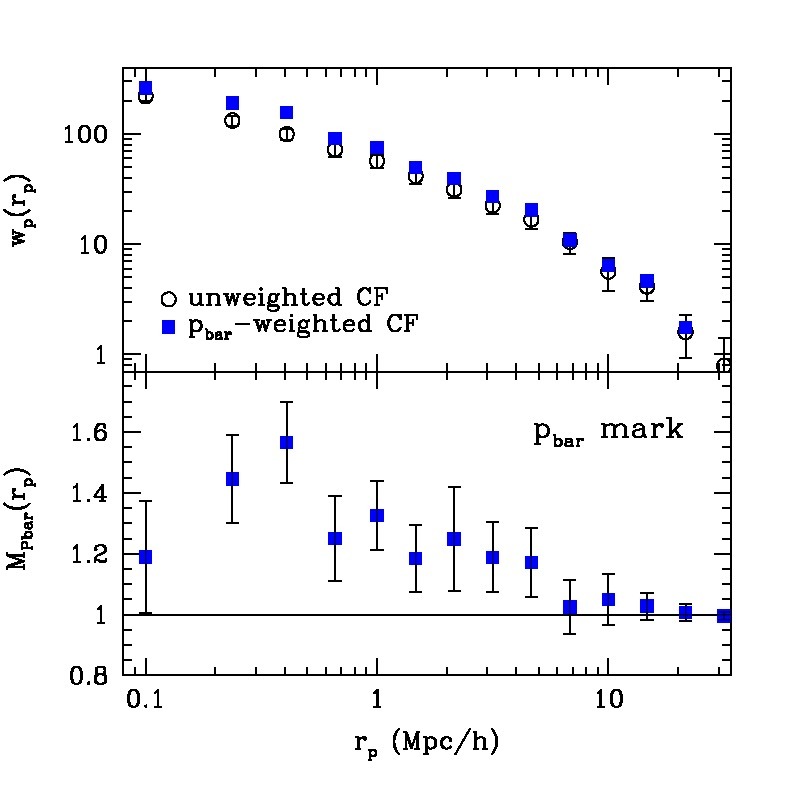 Then the ratio of (1+W)/(1+ξ), which is the marked correlation function M(r), tells us whether galaxies with high values of the weight are more dense or less dense environments on average. And if 1+W=1+ξ, or in other words M=1, then the weight is not correlated with the environment at all. First, I’ll show you one of our main results from that paper using Galaxy Zoo 1 data. The upper panel shows the clustering of galaxies in the sample we selected, and it’s a function of projected galaxy separation (rp). This is something other people have measured before, and we already knew that galaxies are clustered more than random clustering. 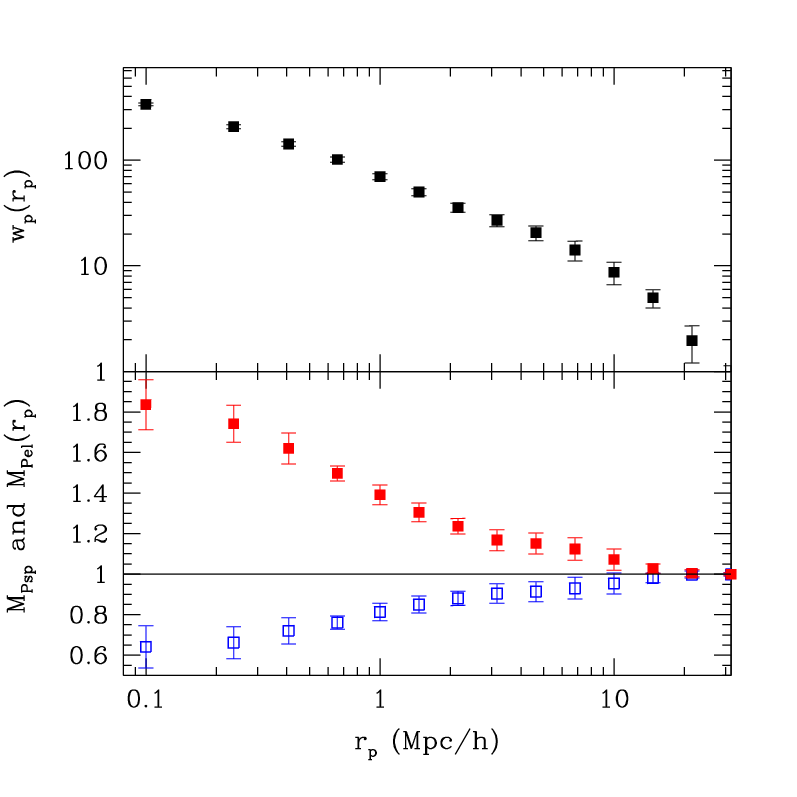 But then we weighted the galaxies by the GZ elliptical likelihood (based on the fraction of classifiers identifying the galaxies as ellipticals) and then took the (1+W)/(1+ξ) ratio, which is M(rp), and that’s shown by the red squares in the lower panel. When we use the spiral likelihoods, the blue squares are the result. This means that elliptical galaxies tend to be found in dense environments, since they have a M(rp) ratio that’s greater than 1, and spiral galaxies are in less dense environments than average. When I first ran these measurements, I expected kind of noisy results, but the measurements are very precise and they far exceeded my expectations. Without many visual classifications of every galaxy, this wouldn’t be possible. Second, using Galaxy Zoo 2 data, we measured the clustering of disc galaxies, and that’s shown in the upper panel of the plot above. Then we weighted the galaxies by their bar likelihoods (based on the fractions of people who classified them as having a stellar bar) and measured the same statistic as before. 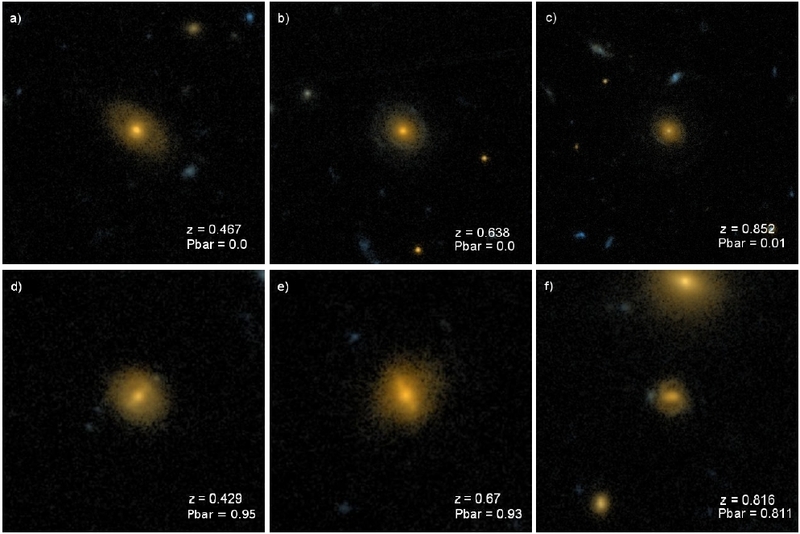 The result is shown in the lower panel, and it shows that barred disc galaxies tend to be found in denser environments than average disc galaxies! This is a completely new result and had never been seen before. Astronomers had not detected this signal before mainly because their samples were too small, but we were able to do better with the classifications provided by Zooites. We argued that barred galaxies often reside in galaxy groups and that a minor merger or interaction with a neighboring galaxy can trigger disc instabilities that produce bars. What kinds of science shall we use these great datasets and statistics for next? My next priority with Galaxy Zoo is to develop dark matter halo models of the environmental dependence of galaxy morphology. 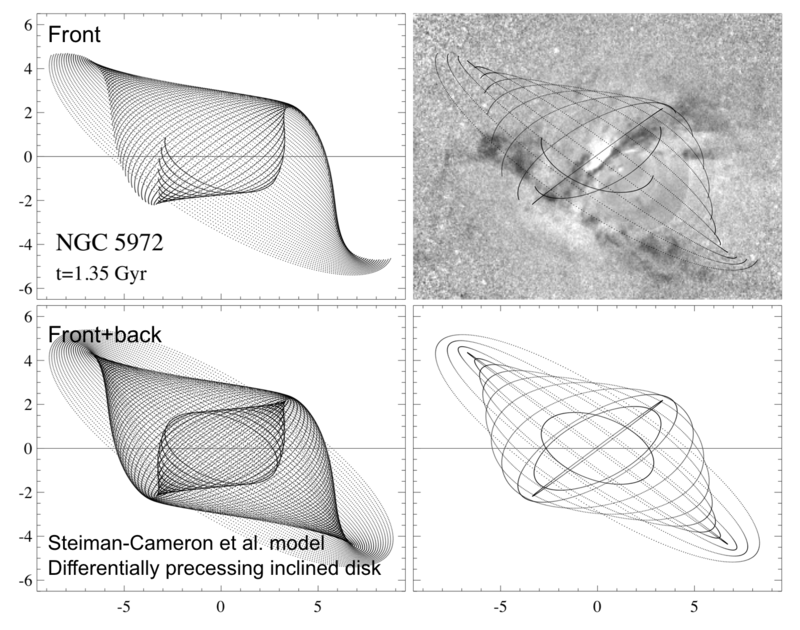 Our measurements are definitely good enough to tell us how spiral and elliptical morphologies are related to the masses of the dark matter haloes that host the galaxies, and these relations would be an excellent and new way to test models and simulations of galaxy formation. And I’m sure there are many other exciting things we can do too. …One more thing: if you’re interested, you’re welcome to check out my own blog, where I occasionally write posts about citizen science. In this paper, we take a look at the most crucial event in the life of a galaxy: the end of star formation. We often call this process “quenching” and many astrophysicists have slightly different definitions of quenching. Galaxies are the place where cosmic gas condenses and, if it gets cold and dense enough, turns into stars. The resulting stars are what we really see as traditional optical astronomers. Not all stars shine the same way though: stars much more massive than our sun are very bright and shine in a blue light as they are very hot. They’re also very short-lived. Lower mass stars take a more leisurely pace and don’t shine as bright (they’re not as hot). This is why star-forming galaxies are blue, and quiescent galaxies (or “quenched” galaxies) are red: once star formation stops, the bluest stars die first and aren’t replaced with new ones, so they leave behind only the longer-lived red stars for us to observe as the galaxy passively evolves. Example images of galaxies classified by you. There are blue, green and red spirals, and blue, green and red ellipticals. 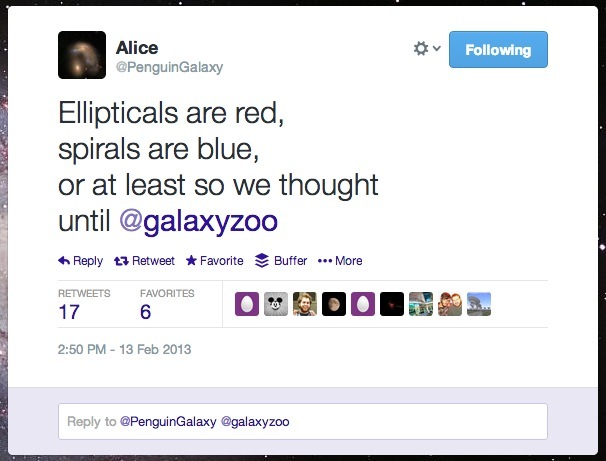 As @penguin galaxy (aka Alice) put it…. The received wisdom in galaxy evolution had been that spirals are blue, and ellipticals are red, meaning that spirals form new stars (or rather: convert gas into stars) and ellipticals do not form new stars (they have no gas to convert to stars). Since you’re taking part in Galaxy Zoo, you know that this isn’t entirely true: there are blue (star-forming) ellipticals and red (passive) spirals. 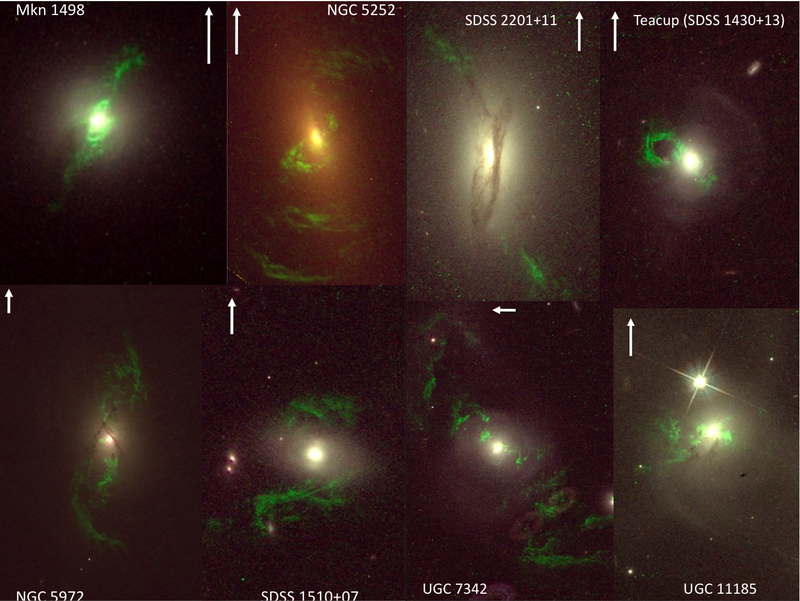 It’s those unusual objects that we started Galaxy Zoo for, and in this paper they help us piece together how, why and when galaxies shut down their star formation. You can already conclude from the fact that blue ellipticals and red spirals exist that there is no one-to-one correlation between a galaxy’s morphology and whether or not it’s forming stars. The colour-mass diagram of galaxies, split by shape. On the right: all galaxies. On the left: just the ellipticals (or early-types) on top and just the spirals (or late-types) on the bottom. On the x-axis is the galaxy mass. On the y-axis is galaxy colour. Bottom is blue (young stars) and top is red (no young stars). A few years back, astronomers noticed that not all galaxies are either blue and star forming or red and dead. There was a smaller population of galaxies in between those two, which they termed the “green valley” (the origin of the term is rather interesting and we talk about it in this Google+ hangout). So how do these “green” galaxies fit in? The natural conclusion was that these “in between” galaxies are the ones who are in the process of shutting down their star formation. They’re the galaxies which are in the process of quenching. Their star formation rate is dropping, which is why they have fewer and fewer young blue stars. With time, star formation should cease entirely and galaxies would become red and dead. Ok, why is this green valley a red herring you ask? Simple: the green valley galaxies aren’t a single population of similar galaxies, but rather two completely different populations doing completely different things! And what’s the biggest evidence that this is the case? Some of them are “green spirals” and others are “green ellipticals”! (Ok, you probably saw that coming from a mile away). So, we have both green spirals and green ellipticals. First: how do we know they must be doing very different things? If you look at the colour-mass diagram of only spirals and only ellipticals, we start to get some hints. Most ellipticals are red. A small number are blue, and a small number are green. If the blue ellipticals turn green and then red, they must do so quickly, or there would be far more green ellipticals. There would be a traffic jam in the green valley. 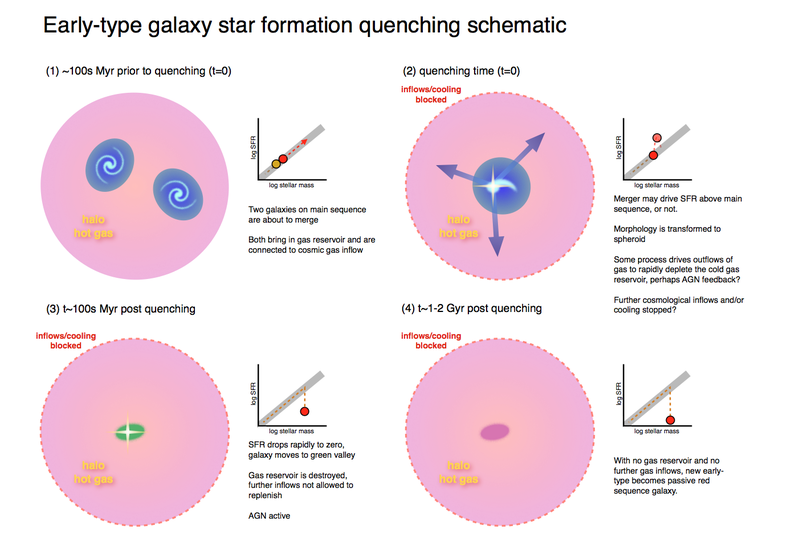 So we suspect that quenching – the end of star formation – in ellipticals happens quickly. In the case of spirals, we see lots of blue ones, quite a few green one and then red ones (Karen Masters has written several important Galaxy Zoo papers about these red spirals). If spirals slowly turn red, you’d expect them to start bunching up in the middle: the green “valley” which is revealed to be no such thing amongst spirals. We can time how fast a galaxy quenches. On the x-axis is the optical colour, dominated by young-ish stars, while on the y-axis is a UV colour, dominated by the youngest, most short-lived stars. We can confirm this difference in quenching time scales by looking at the ultraviolet and optical colours of spirals and ellipticals in the green valley. What we see is that spirals start becoming redder in optical colours as their star formation rate goes down, but they are still blue in the ultraviolet. Why? Because they are still forming at least some baby stars and they are extremely bright and so blue that they emit a LOT of ultraviolet light. So even as the overall population of young stars declines, the galaxy is still blue in the UV. Ellipticals, on the other hand, are much redder in the UV. This is because their star formation rate isn’t dropping slowly over time like the spirals, but rather goes to zero in a very short time. So, as the stellar populations age and become redder, NO new baby stars are added and the UV colour goes red. Galaxies form stars because they have gas. This gas comes in from their cosmological surroundings, cools down into a disk and then turns into stars. Galaxies thus have a cosmological supply and a reservoir of gas (the disk). We also know observationally that gas turns into stars according to a specific recipe, the Schmidt-Kennicutt law. Basically that law says that in any dynamical time (the characteristic time scale of the gas disk), a small fraction (around 2%) of that gas turns into stars. Star formation is a rather inefficient process. With this in mind, we can explain the behaviour of ellipticals and spirals in terms of what happens to their gas. A cartoon version of our picture of how spiral galaxies shut down their star formation. Spirals quench their star formation slowly over maybe a billion years or more. This can be explained by simply shutting off the cosmological supply of gas. The spiral is still left with its gas reservoir in the disk to form stars with. 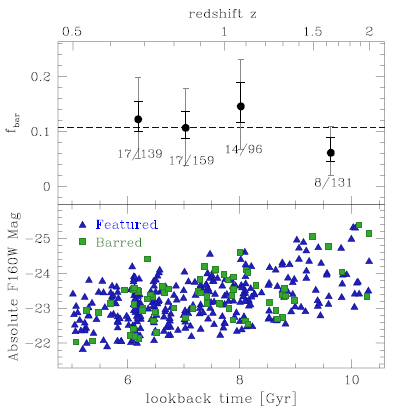 As time goes on, more and more of the gas is used up, and the star formation rate drops. Eventually, almost no gas is left and the originally blue spiral bursting with blue young stars has fewer and fewer young stars and so turns green and eventually red. That means spirals are a bit like zombies. Something shuts off their supply of gas. They’re already dead. But they have their gas reservoir, so they keep moving, moving not knowing that they’re already doomed. A cartoon version of how we think ellipticals shut down their star formation. Note: this is a post by Galaxy Zoo science team member Edmond Cheung. 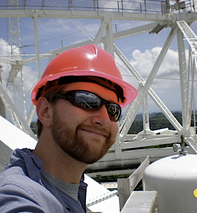 He is a graduate student in astronomy at UC Santa Cruz, and his first Galaxy Zoo paper was accepted to the Astrophysical Journal last week. Below, Edmond discusses in more depth the new discoveries we’ve made using the Galaxy Zoo 2 data. Observations show that bars – linear structures of stars in the centers of disk galaxies – have been present in galaxies since z ~ 1, about 8 billion years ago. In addition, more and more galaxies are becoming barred over time. In the present-day Universe, roughly two-thirds of all disk galaxies appear to have bars. Observations have also shown that there is a connection between the presence of a bar and the properties of its galaxy, including morphology, star formation, chemical abundance gradients, and nuclear activity. Both observations and simulations argue that bars are important influences on galaxy evolution. 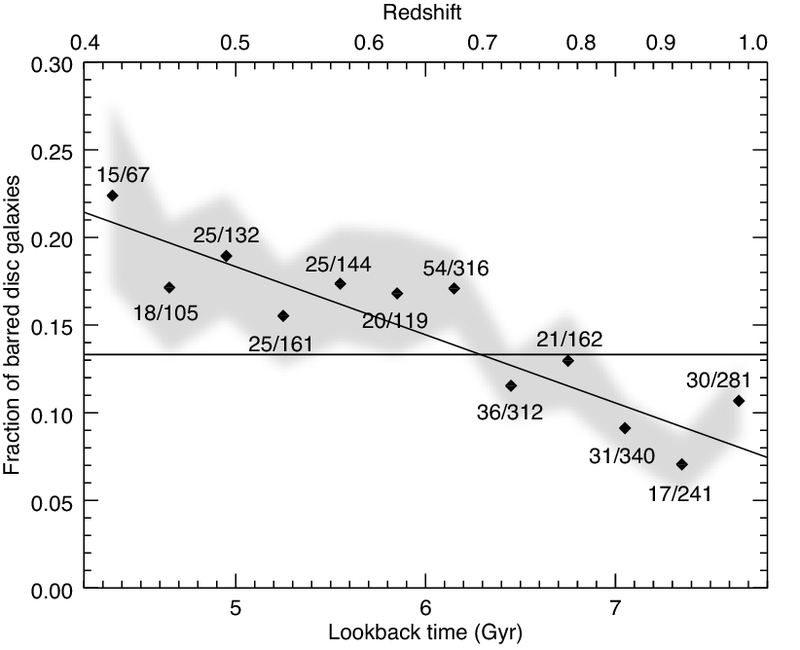 In particular, this is what we call secular evolution: changes in galaxies taking place over very long periods of time. This is opposed to processes like galaxy mergers, which effect changes in the galaxy extremely quickly. 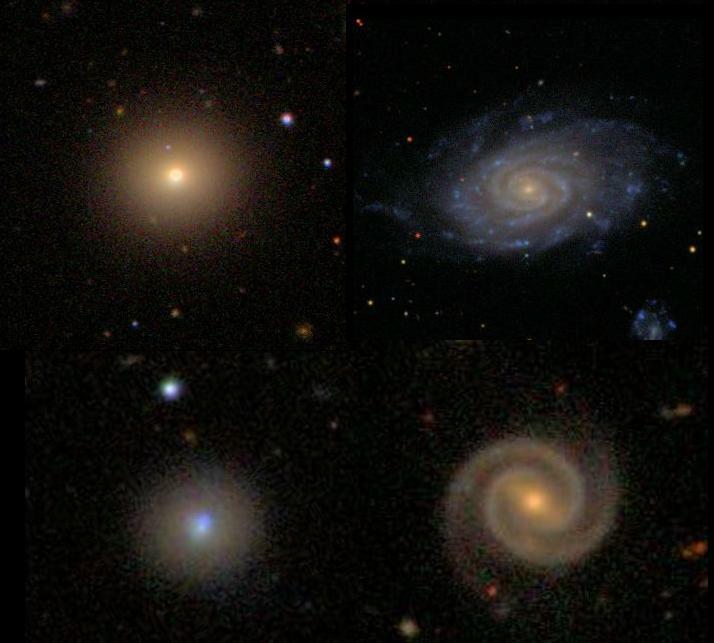 Examples of galaxies with strong bars (linear features going through the center) as identified in Galaxy Zoo 2. To date, there hasn’t been much evidence of secular evolution driven by bars. In part, this is due to a lack of data – samples of disk galaxies have been relatively small and are confined to the local Universe at z ~ 0. This is mainly due to the difficulty of identifying bars in an automated manner. With Galaxy Zoo, however, the identification of bars is done with ~ 84,000 pairs of human eyes. Citizen scientists have created the largest-ever sample of galaxies with bar identifications in the history of astronomy. The Galaxy Zoo 2 project represents a revolution to the bar community in that it allows, for the first time, statistical studies of barred galaxies over multiple disciplines of galaxy evolution research, and over long periods of cosmic time. In this paper, we took the first steps toward establishing that bars are important drivers of galaxy evolution. We studied the relationship of bar properties to the inner galactic structure in the nearby Universe. We used the bar identifications and bar length measurements from Galaxy Zoo 2, with images from the Sloan Digital Sky Survey (SDSS). The central finding was a strong correlation between these bar properties and the masses of the stars in the innermost regions of these galaxies (see plot). This plot shows the central surface stellar mass density plotted against the specific star formation rate for disks identified in Galaxy Zoo 2. The colors show the average value of the bar fraction for all galaxies in that bin. 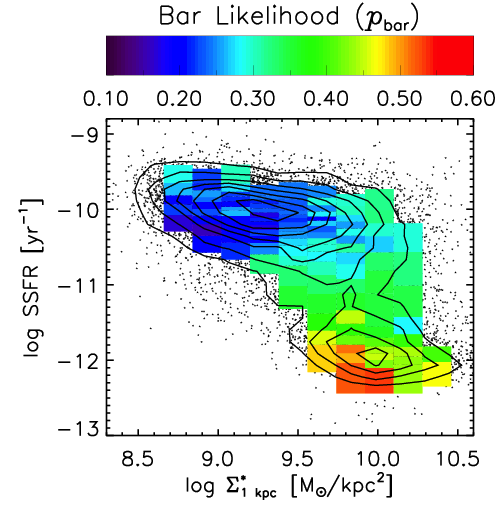 This plot shows that the presence of a bar is clearly correlated with the global properties of its galaxy (Σ and SSFR). We compared these results to state-of-the-art simulations and found that these trends are consistent with bar-driven secular evolution. According to the simulations, bars grow with time, becoming stronger (they exert more torque) and longer. During this growth, bars drive an increasing amount of material in towards the centers of galaxies, resulting in the creation and growth of dense central components, known as “disky pseudobulges”. Thus our findings match the predictions of bar-driven secular evolution. We argue that our work represents the best evidence of bar-driven secular evolution yet, implying that bars are not stagnant structures within disk galaxies, but are instead a critical evolutionary driver of their host galaxies. 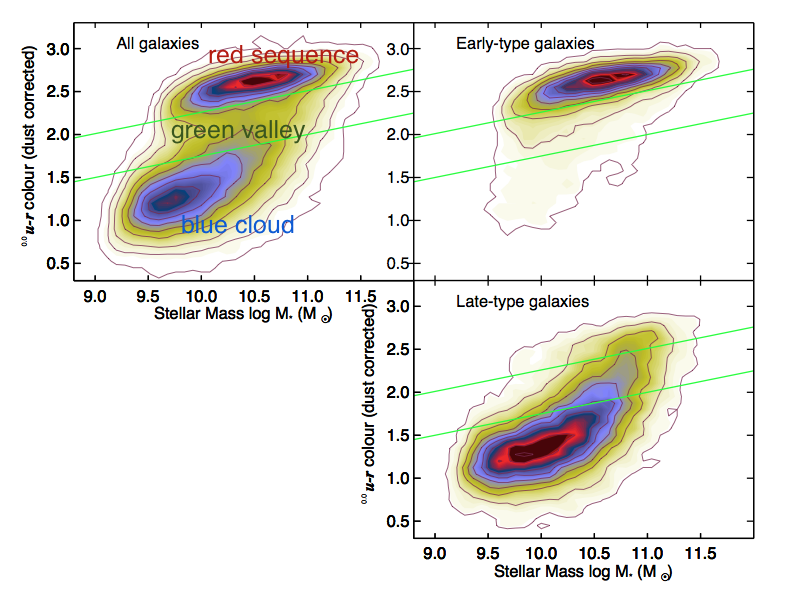 It’s always exciting to see a new Galaxy Zoo paper out, but today’s release of our latest is really exciting. Galaxy Zoo 2: detailed morphological classifications for 304,122 galaxies from the Sloan Digital Sky Survey, now accepted for publication in the Monthly Notices of the Royal Astronomical Society, is the result of a lot of hard work by Kyle Willett and friends. Lead author Kyle, seen here taking a rare moment away from reducing Galaxy Zoo data. Galaxy Zoo 2 was the first of our projects to go beyond simply splitting galaxies into ellipticals and spirals, and so these results provide data on bars, on the number of spiral arms and on much more besides. The more complicated project made things more complicated for us in turning raw clicks on the website into scientific calculations – we had to take into account the way the different classifications depended on each other, and still had to worry about the inevitable effect that more distant, fainter or smaller galaxies will be less likely to show features. We’ve got plenty of science out of the Zoo 2 data set while we were resolving these problems, but the good news is that all of that work is now done, and in addition to the paper we’re making the data available for anyone to use. You can find it alongside data from Zoo 1 at data.galaxyzoo.org. One of the most rewarding things about the project so far has been watching other astronomers make use of the original data set – and now they have much more information about each galaxy to go on.